Over the last few years, with increasing home values, real estate prices in Minneapolis and the Metro area were getting so high that many buyers were being priced out of the market. 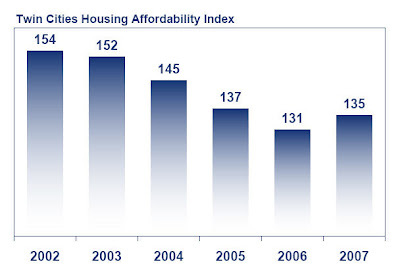 Housing affordability was at an all time low in 2006 and helped put on the brakes for the out of control real estate market. With the release of the 2007 Market Report this last month, some good news is coming forth. The Twin Cities Housing Affordability Index is showing that buyers are getting back into the game and can once again afford to buy a home. I can only assume that 2008 will also see a similar increase. Good news for our market!